Variety reported on Tuesday that the new series is called "Swagger." 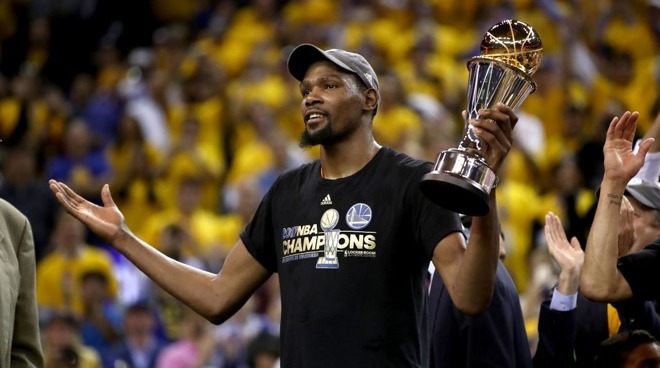 The show will not just be a biography of Durant, but also delve into the organization that spawned Durant, the Amateur Athletic Union (AAU), and look at the lives of players, families, and coaches involved with the program. The feature will be produced by Durant himself, in association with Brian Grazer and Ron Howard's Imagine Television. Reggie Rock Bythewood will write and direct. Bythewood has worked with Imagine before developing his own creation "Shots Fired" for Fox. Durant himself has confirmed the deal in a Tweet. In late January, Apple signed a deal with "La La Land" writer and director Damien Chazelle. This was rapidly followed-up with a deal reported on Thursday that Apple is funding an anthology series focusing on immigrants in the United States.